Harrison Weir was a son of Lewes and a man of many interests. He was an accomplished artist, author, journalist, naturalist, ornithologist, poultryman, horticulturalist and poet of nature. John Smithson created the Harrison Weir Collection and is visiting from New Zealand to collect the final information he needs to complete a biography. His talk will cover Weir’s life and achievements, including his legacies to the Borough of Lewes and to the Royal Academy. Harrison Weir was born in Lewes in 1824 and had links to the printers John and George Baxter. His family and artistic links with the town lasted a lifetime that spanned a period from the birth of the Illustrated London News in 1842 to his death in 1906. He was an acclaimed artist and illustrator, particularly well known for his images of animals and birds. John Smithson is a second generation New Zealander. He studied graphic design and, like Hamilton Weir, developed a particular passion for the fancier breeds of show cats. In 2008 he founded the Harrison Weir Collection, and now has the world’s largest private collection of Weir’s antiquarian art, ephemera and books – see www.harrisonweir.com. In December 1904 newspapers across the country considered it worthy of report that Solomon Savage, a Lewes borough councillor, had been fined the enormous sum of £100 for “keeping a bettinghouse”. His nephew was also implicated. Solomon Savage was born in 1828 in Sundridge, Kent, one of the large family of Henry & Martha Savage. 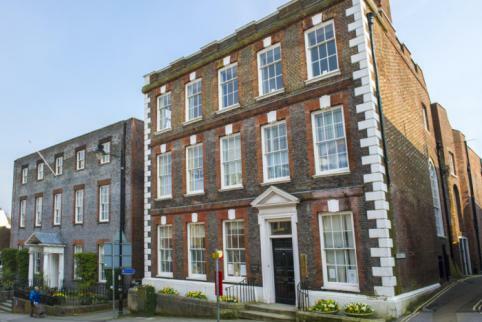 By the mid-1830s the family had moved to Lewes and the 1841 census finds them in Spring Gardens – his father was away on census night but his eldest brother was a paper maker. Soon afterwards they moved to Ashling, near Chichester. By 1851 they were in Shoreham, Kent, where Solomon, now 22, and his father were both paper makers, while his mother and a sister were paper factory workers. Solomon married in 1852, and by 1861 he and his wife were again in Shoreham with his father-in-law, a grocer and baker. Solomon was now a stationer and rag merchant. His father was still a paper maker at Shoreham in 1871, when he was in his mid-70s. There were paper mills in Sundridge and Ashling as well as in Lewes and Shoreham, and Spring Gardens was well located for an employee at the Molineux’s paper mill in the Pells, so it is tempting to see the family’s movements as following the demand for skilled paper makers. A stationer of course sold the paper mills’ products, while a rag merchant provided their raw material. The Molineuxs’ paper mills in the Pells and Isfield were not finally sold until 1857, but the auction advertisements noted that the mills had been untenanted for many years, that the buildings were in decay and that the building materials would be auctioned separately on the day after the real estate. The removal of the paper mills enabled the Pells area to be re-developed for leisure uses and gave much more convenient access to the town’s riverbank walk. In the next decade Solomon lost his wife and returned to live in Lewes, and for the rest of his long life he lived in Fisher Street, in St John-sub-Castro parish. He was a widower by 1871, and no children are noted, but he was sometimes assisted by a niece or nephew. In 1871 he was a stationer and rag merchant; in 1891 a wholesale stationer; and in 1901 a wholesale stationer and rag merchant. He also invested in property, in Fisher Street and in some bankrupt shop premises in Ringmer. At his death his occupation was given as grocer, and in 1892, 1895 & 1906 he held contracts for the supply of tea and groceries to Boards of Guardians as far afield as Hailsham. Solomon Savage stood unsuccessfully for the Borough Council in 1889, describing himself as ‘the independent candidate’ in his press advertising, but he was successful at a by-election in 1890. He was then described as a wholesale stationer of Fisher Street, while his opponent was a High Street fishmonger. He was re-elected for Castle ward in 1891, 1894, 1897 & 1900. His 1904 conviction did no harm to his political career – in 1914 he was chosen as one of the Borough’s aldermen, and he remained an alderman until his death in 1917 at the age of 88. The 1904 case was not his first or last experience of the local courts, though he was not always in the dock. In 1864 a Southover labourer was charged with throwing a half pint pot at him. A young labourer was charged with attempting to defraud his shopman in 1870. In 1873 he gave evidence when some miscreants were charged with stealing 36 rabbit skins and two clocks from him. In 1875 he was charged with indecent assault and ill-treating a servant, but she did not turn up to give evidence against him. In 1893, described as “a councillor and well known racing gentleman”, he was accused of an assault on a publican. In 1898 he was charged with keeping a dog without a licence, and his excuse that it was someone else’s was not accepted. In November 1906 he gave evidence about the behaviour of the Bonfire Boys in Commercial Square. In 1909 a teenager was charged with stealing jam, marmalade, nuts, glass jars and a box from his Lewes warehouse. Like many local traders, he sued, and was sued, for debts. Sources: Censuses, with thanks to Mat Homewood, and local newspaper reports from the British Newspaper Archive. This excellent photograph of Malling Mill, with the Mill House just over the brow of the hill, was posted on the Lewes Past website by Wayne Quinnell in January. It appears to have been taken from a James Cheetham postcard. Another version of what appears to be the same original image is included on page 58 of Bob Cairns’ book, ‘Lewes in Old Picture Postcards’, published in 1988. 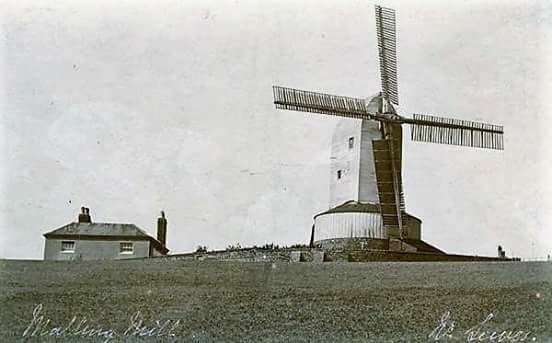 Malling Mill burned down in 1908. Incorporated into the Lewes Town Book is the following letter from the senior officer of the Russian (mainly Finnish) prisoners of war who had been captured in the Crimean War and held in the town in the old prison on North Street. We the officers in the Russian Service cannot take our departure from England without expressing our sentiments of gratitude and goodwill towards the Inhabitants of the Town of Lewes and its neighbourhood. When by the fortune of War we became resident in the Town we were received with a frank and generous courtesy which convinced us that the People of Lewes regarded us as less the subjects of a foreign and hostile power than as Men who in the discharge of their duty had fallen into misfortune. We have enjoyed the hospitality of many, and urbane treatment from all – A somewhat lengthy captivity has thus been greatly alleviated and our pleasure in the anticipation of returning to our Native Country is much modified by the regret we feel in thus bidding farewell to those who have shown so much kindness. We shall always cherish a lively remembrance of the good Old Town and of the many hospitable abodes which surround it, and thus wishing all prosperity to Lewes, we take a respectful and Affectionate Adieu. This postcard published in the 1920s by O.J. 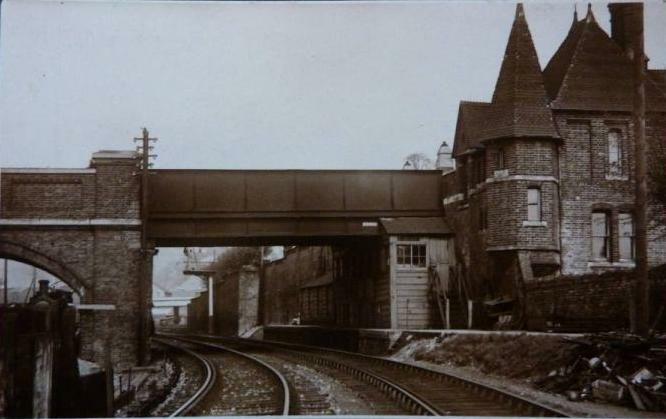 Morris, Beulah Hill, Norwood, shows the bridge over the Lewes- Uckfield railway that led from Friars Walk (to the left) to Burwood Godlee’s house called ‘Leighside’. At this date Leighside’s Victorian Gothic gatehouse stood empty and derelict. Parts of the brick bridge survive. A summary of the accounts “shewing the Cost and Expence of Building, Furnishing and Completing the said Prison” was published by William Vidler Langridge, clerk to the New Prison Committee were submitted at Lewes on 13 October 1854. They showed that the total cost of building the prison was just over £56,000. Over 80% of the cost was covered by loans, with just over £12,000 coming from 5 annual rates raised in 1850-1854 and £3,000 coming from the proceeds of the sale of the old North Street prison. Loan finance was and is the norm for major public sector projects, and already over £5,000 had been paid servicing the new debt. The main contractors were Messrs Locke and Nesham, whose bill was almost £30,000, while a separate contractor, John Fabian, built the prison boundary wall for a further £1,800. Over 5,000 tons of flints were purchased at a cost of almost £2,000. Ventilation, heating and hot water supplies came from separate contractors, and Samuel Thomas was paid £350 for locks and £250 for gongs and bells. The only Lewes-based contractor identified is Ebenezer Morris of the Cliffe, who was paid £590 for supplying the gas fittings. Professional fees were of course also necessary. The architect received £1,600, the clerk of the works £600, the treasurer nearly £300, the clerk of the peace £550 and the clerk to the New Prison Committee £450. The last two roles were both held at this date by William Vidler Langridge, who lived at School Hill House in All Saints parish (see image). He inherited his role as clerk of the peace from his father William Balcombe Langridge and passed it on to his son William Kirby Johnson Langridge. Between them they held this role from 1806 to 1882. There was a poorhouse belonging to All Saints parish on School Hill, but in 1758 the inhabitants of the parish decided that it was in poor repair, and should be sold off. At auction it raised £202. The parish then agreed to purchase a plot of land on the east side of St Nicholas Lane, “vulgarly called Dolphin Lane”, which cost 12 guineas. They then built five tenements for the accommodation of the poor on the site, at a cost of £201 14s 11¾d (the overseers’ accounts were very accurately kept). As the population grew the poorhouse accommodation had to be extended. There was an extension in 1797 that cost a further £80, and a further extension in 1805 that required the purchase of additional land and cost £244. Source: Rev T.W. Horsfield, ‘History and Antiquities of Lewes’ (1824), vol.1. This entry was posted in Art & Architectural History, Biographical Literature, Economic History, Family History, Legal History, Lewes, Local History, Military History, Political History, Social History. Bookmark the permalink.